Kirk Yuhnke What Did Do to Twitter? Hey, buddy, uh…well.. I don’t know how to tell you this Kirk but your name is upside… Did you piss off twitter? 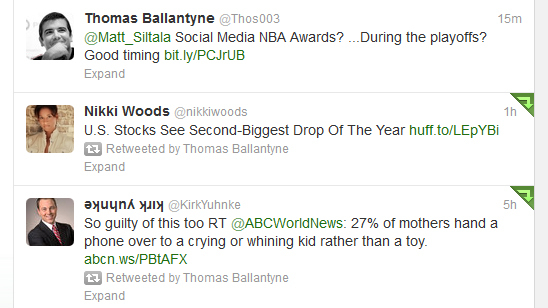 Just a fluke I’m sure, but I found it funny that Kirk Yuhnke’s name was upside down on twitter. And if you don’t follow Kirk you should. He’s a local Phoenix reporter covering morning News. Meet him at the ABC15 Live News Tweet-up they did. Thanks Thomas. BTW – Twitter has a conspiracy against me!!!!!! Not really, just a little fun from http://www.fliptext.net/ Hope you’re well. I kinda got that from your tweet… Did a quick google search on it after I posted the article. But I was still entertained and the flipped text did exactly what it was intended to do, it grabbed my attention. And yes, life is good.